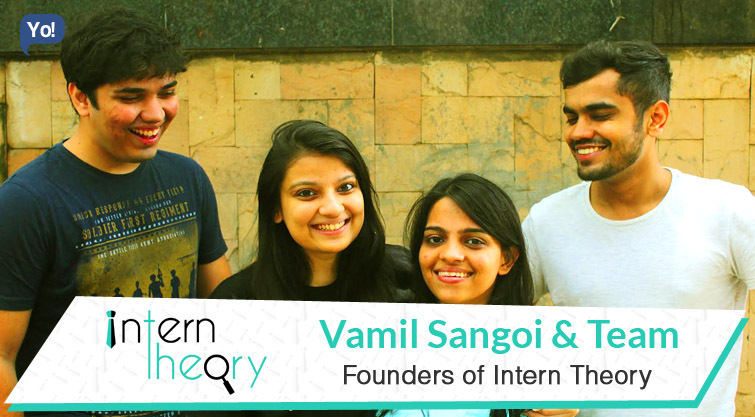 Young & driven, the team of InternTheory is set to change the face of internship system in India. This team of graduates from Dwarkadas J. Sanghvi College of Engineering, Mumbai realized how lazy and unorganized the internship system is in India and how it badly affects the career of graduate students; consequently, the future of the country. To resolve this issue, they created Interntheory.com, an online portal to connect students seeking internship with companies looking for interns in order to simplify the whole process on both ends. In spite of initial hurdles, today InternTheory is partnered with over 2,700 companies and has over 26,000 active student users. Currently available in Mumbai, Delhi, Bangalore, Pune, & Hydrabad, InternTheory has firm plans to expand its service to pan-India and acquire over a million students by next 3 years. InternTheory is an effort to simplify the process of getting an internship for candidates and finding interns for companies. An online internship portal which bridges the gap between employers and students in the internship marketplace. Currently, it is an everyday concern for companies & interns. We built InternTheory, to resolve this point for students & employers with technology. As engineering students, we know the importance of internship in an under-grad’s life. As of now, landing a meaningful internship is not all that easy. Added to this is the fact that India is still far from being Internship-friendly country. With the idea to help students experience and find out what they actually love doing before they make a career out of it, we launched our MVP while in college. The feedback we received from happy students around us, was enough to convince us to convert this website into a fully-fledged business. And so we worked day in and day out with a vision to make every last student in India realize the importance of internships and give them the power to experiment and find out what they like before they put their feet in the corporate world. The chicken or the egg situation, i.e. should we get companies on board first or students first, because either of the parties need the other party on board to get convinced to register? Apart from that, we faced major roadblocks finding that many students lacked the motivation to intern somewhere. Also, on the other side, it was difficult to convince employers to trust a company so new in the market. Added to that was our age: all the founding partners were 21 years old! Motivation. We went miles to motivate students and make them realize the importance of internships. We provided students personal services, which not many tech companies offer. We made sure good students get awesome internship experiences. We also made it a point to maintain good relations with placement cells of as many colleges as possible. Once they were convinced of our ideology, they helped us motivate students to go ahead and do internships. These efforts solved both our major problems. We managed to get more students on board which in turn helped us convince companies that we were equipped to handle their internship requirements. We have been backed by two high-on-energy individuals, Mr. Ashok Shah and Mr. Parin Shah. We have a couple of rituals/traditions at our office, which keeps everyone engaged. One of them is a small games every day where everyone takes turns each day to be the game-master and set rules for the day. Apart from this, regular outings, celebrations, etc. keep us fresh. Passionate, Shamelessness, & ‘Jugaadu’ nature (try to make it work attitude). We have discovered the power of WhatsApp for marketing on the student front. We use a couple of online tools to automate things. We use Buffer to handle multiple social media platforms; Asana and Slack for team communication and task management. We do try quite a lot of things. First being ‘to-do lists’. We have a daily to-do list, a to-do list for short term goals and a to-do list for long term goals. We keep aside some time of the day to learn and update our knowledge. Apart from the above mentioned activities, we run a part-time reading club where all of us read a book for the month and conduct monthly meetings to discuss the book. This ensures productivity and helps us develop. We need to decrease the time we spend behind PokémonGo. One tip to success: Get things done, anyhow. One mistake you believe every individual must avoid: Don’t be afraid to start/launch early. One most important lesson that you have learnt till now: We should not lose track of the problem while searching for the solution. We plan to facilitate internships to over a million students in the next 3 years. Having said that, we wish to maintain high quality for our applications to make the intern-training process for companies a little less tedious. We intend to incorporate high level of industry based training for our students before they apply for internships. If you get a chance to start your career again, what would you do differently this time? The idea of InternTheory was born in 2011-2012 but the actual work began in 2014-2015. If we get a chance to redo, we would like to start in 2011-2012 itself.